Vom are a Glasgow based noise rock outfit with occult leanings and how I've never been aware of them is beyond me. It seems that Vom have had a couple of previous releases including a split with Gummy Stumps. Those releases apparently had a colder goth-edge to them with Altered States garnering praise from many quarters. Initiation foregoes much of that for a more experimental guitar based sound. And aside from the eerie unnerving opener and doomy synth based closer Initiation for the most part is firmly rooted in the noise rock genre and it's something of a cracking listen. It's the best scuzzed out listen I've heard from Glasgow since Nackt Insecten and Moon Unit. Before the onslaught kicks off Initiation opens with the bleak ritual atmospherics of the title track. Vom immediately up the ante with 'Ishtar'. Seering noise atmospherics are smeared over a tight rhythm section, with a low slung based anchored to stark and dynamic rhythms. The guitars are as formless as Skullflower emitting waves of textured feedback and waves of caustic squall. There's a midsection of improvised guitar noise atmospherics before they lurch headfirst into the void. 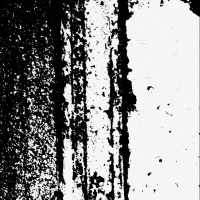 'The Binding' plummets further with low lumbering basslines sliced with elongated feedback wails. Powerful and controlled with vocals that are hollered and distant deployed in a similar way to Ramleh when in their 'rock' formation. Much of this recalls the powerhouse rhythms and wayward guitar tendencies of something like Terminal Cheesecake or Sweet Tooth, and a more open-ended Skullflower when they were still sharing members with Ramleh. So it's eighties noise rock, and that's no bad thing at all. Lunging further downwards with its clipped guitar spurts and expanded feedback wails over punishing rhythms 'Abramelin' is a sprawling vortex of sound marking a dizzying descent as it explores an unholy fusion of occultism and guitar noise. Vom are on form and these tracks represent some of the finest guitar noise excursions I've heard in quite some time. The intensity of the scorched careering guitar sound of the previous tracks is held back on 'Attrition' for a starker and bleaker offering that recalls moments from PiL's un-compromising album The Flowers of Romance. Filled with dead air textures, it really permits the improvised drumming to come to the fore amidst some nuanced bass tones. The closer, meanwhile, dispenses with most of what's come before with The Cure-like bleak grey textures invoking the masterful old ones on the drum machine led minimal synths of 'Old Gods'. Its doomy setting is something of an anomaly on Initiation and judging from their prior releases it could be considered a knowing nod to some of their earlier influences that surfaced on their previous album Altered States.